This monograph is an innovative endeavour in many ways. First, it brings to the fore the synergy between human evolution and economic and social progress. Second, it acknowledges the critical contributions from the routine adherence to contextual truth and contextual non-violence of humanity at large. 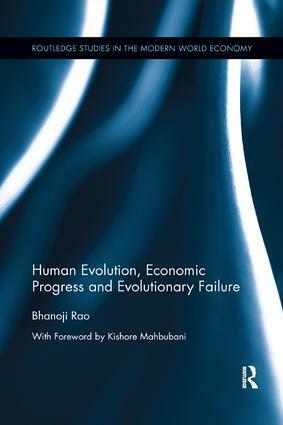 Finally, it argues that the world is sliding towards evolutionary failure by not moving further forward in the adherence to the two core human values. For all those interested in development in a holistic sense, the book will inspire thinking and debate. Human evolution will go on – one way or the other – with or without adherence to truth and non-violence. The book stresses the time is now, to go for the best and eschew the worst. Bhanoji Rao is Adjunct Professor at the Lee Kuan Yew School of Public Policy, Singapore, and Governing Board Member, Gandhi Institute of Technology and Management (GITAM), Visakhapatnam and the ICFAI Foundation for Higher Education (IFHE), Hyderabad. He has authored/co-authored and edited/co-edited 18 books, authored/co-authored 62 papers in refereed journals and 14 monographs, and contributed over 100 columns in print media in India and Singapore. His consultancy clientele has included Singapore Airlines, IBM – Singapore, International Development Research Centre (IDRC)–Canada, UNESCAP, the World Bank and most recently Asian Development Bank (ADB), Manila.